The Kakani village tour is popular village trek around The Kathmndu Valley at 2073m above sea level. An hours scenic drive north of Kathmandu, Kakani village is an ideal start for this trek, it is a great introduction into the village life of Nepal.Kakani is situated in a pristine area close to the Kathmandu valley, it is ideally suitable for short trekking holidays with family and friends. The trek offers excellent mountain views of Ganesh Himal, Langtang Himal and the Annapurnas. This trek is an extension of Sundarjal-Nagarkot trek that is undertaken mostly within Nepal’s youngest National Park, The Shivapuri National Park. This is the only national park located in the valley, less than 20 kilometers from the international airport. The park is a famous watershed area that provides the majority of Kathmandu’s drinking water. 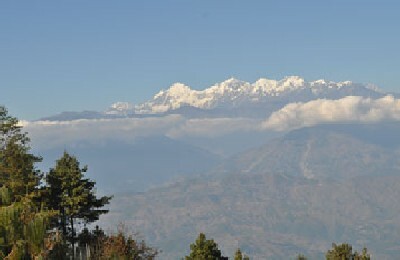 This particular trek, not only benefits from the superb mountain views, but also offers a good insight into the lifestyles, history, culture, religion and traditions of the different people living near to and within the Kathmandu valley.The final portion of the trek takes us to Nagarkot a popular hill station mentioned before on this section of the web site. Welcome from airport / transfer to hotel / introductory program / briefing about the trip. Day 02: City tour in Kathmandu. visiting many of the important sites of historical and architectural interest. Drive to Kakani / situated around 29 km. northwest of Kathmandu / some great views of the Kathmandu Valley to the south / also superb panorama of the Himalayas to the north / walk to Aaledanra along the ridge in the National Park area. Continue along the ridge between the Shivapuri watershed forest / some great mountain views camp at Dhap. Walk from Dhap / through dense forest / climb up to Nagarkot / outstanding views Nagarkot Langtang Himalayan ranges / Annapurna Gaurishanker. Day 06: Early up for sunrise views of the Himalayas / after breakfast drive back to Kathmandu / free day relaxation and shopping..
Day 07: Transfer to airport for onward destination / or continue your tour. Please note: All the trekking itineraries are flexible and can be revised in order to best meet your requirements i.e. your time, interests etc. Please make contact with us if you have any special requirements or interest.